With so many different styles of photography on a given wedding day we continually push ourselves to fit the brides wishes with each one. 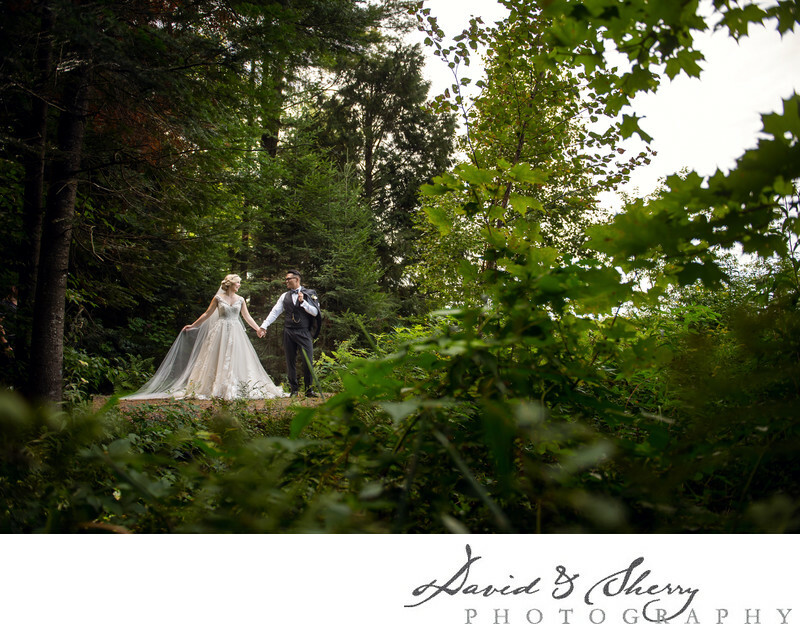 For this wedding at Brooklands Farm in Bracebridge, Ontario our couple took great care to choose their wedding attire to match their interests in life. The bride wore a fantastically detailed wedding gown with lace and beading and a long train while the groom wore a bespoke suit, vest and tie. Our challenge is to create a wide range of pictures in this situation as mom and dad are going to want something more traditional while the bride and groom want to be wowed by epic images that look like they came straight off the pages of a magazine. In this photo we found a pocket of light and posed our bride and groom in that perfect light so we could maximize the detailing in the dress through highlights and shadows while also lighting up her face. This photo really shines and belongs on the cover of a magazine. I love the posing, the lighting, the composition, the texture, mood and colour as it all lends to great Muskoka wedding photography.